The Air Force painting is reflecting some serious paint. The images here are of the painting’s status and a detail of the astronaut, and the very detailed charcoal and white chalk drawing of the astronaut. While not every drawing is so detailed, this one reflects a very completed work, and clearly captures Kapsner’s passion for, and skill when it comes to drawing. During the fall season, two models of note have taken time to pose, including the first woman to be promoted to the rank of Brigadier General in the Minnesota Air Guard, which is part of the Minnesota National Guard, Brigadier General Sandra “Sandy” Best. Another notable model is Air Force Brigadier General David Hamlar, Jr., the first African American to achieve one-star rank in the Minnesota Air National Guard. These remarkable people, whose schedules are beyond busy, visited the studio on multiple occasions to pose. B.G Best, wearing her dress blues, represents women of significant achievement in the military. B.G. Hamlar is shown in the para rescue scene as a medic–a role familiar to him from his deployments around the globe. The Air Force painting takes major shape as of mid-October, 2018. As the Air Force painting begins to take shape, the activity in the studio includes a session with Brigadier General Sandy Best, the first woman in the history of the Minnesota National Guard to be promoted to brigadier general. In her new role, Best serves as chief of staff of the Minnesota Air National Guard and is responsible for command supervision, oversight, and leadership of the 133rd Airlift Wing and the 148th Fighter Wing. Not only does Best oversee operations and readiness for the units, but she is also in charge of manning, training and equipping them. Below are images of Best and the initial drawing, and one with artist Charles Kapsner. 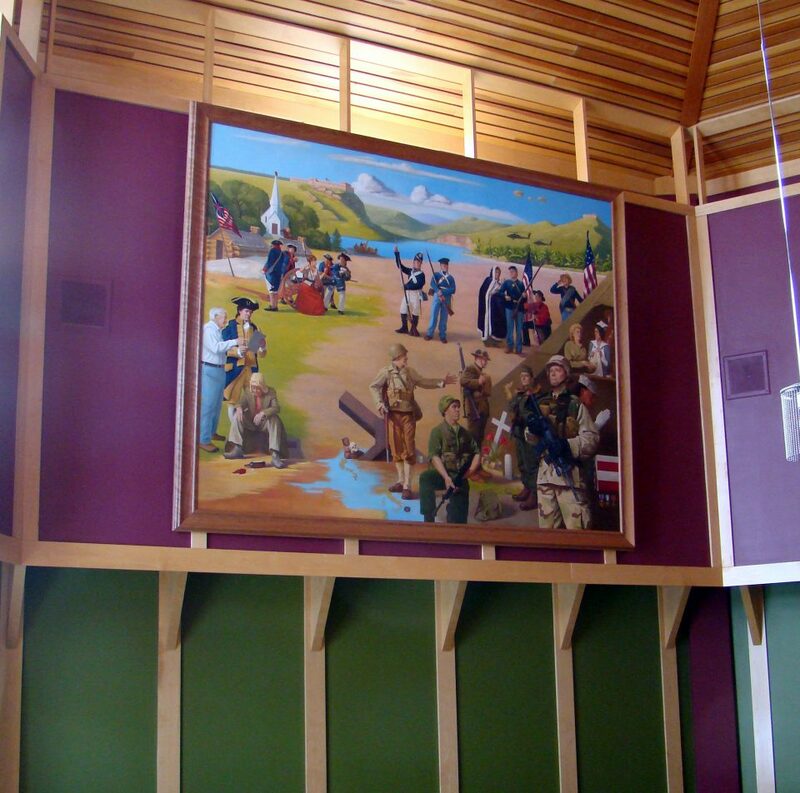 The painting was installed, with the assistance of Tony Armagost and assistance from Ken Pachecki who built the frame, and on hand to provide the know how and major assistance hoisting it from the floor to the wall are staff from the Cemetery, including Kevin Doucette, Steven Cory Engen (who is also portrayed in the painting at bottom right), Val Pilarski, and Donald Stavish. Cemetery staff are always on hand! DULUTH, MN. – Veterans Memorial Hall, a program of the St. Louis County Historical Society, will unveil Minnesota artist Charles Kapsner’s Marine Corps tribute painting at the Duluth Depot. The temporary exhibition is an 8 foot by 10 foot oil painting and will include appearances by the artist. The painting will be displayed from May 17 to May 21 at Veterans Memorial Hall from 9am to 5pm. This is the fourth in a series of five paintings honoring the women and men of each military branch. Regional in location, but national in scope, the paintings uniquely portray the stories, faces, and sacrifices of our nation’s servicewomen and men. Kapsner’s paintings are larger than life and well received by the families of military service veterans. Veterans and active duty military serve as models for the painting which includes soil from Mt. Suribachi which Kapsner ground into the paint as part of the depiction of the Marine flag-raising in 1945. The artist previously created tribute paintings for the Army, Navy and Coast Guard. The last painting will pay tribute to the Air Force. All the paintings will be on permanent display in Committal Hall, Minnesota State Veterans Cemetery in Little Falls. It’s always a big deal to sign off on a painting, the final brush stroke completes it.